An elite group of judges gathered in December to arrive at this shortlist. Winners will be revealed March 1 at the PRWeek Awards dinner in New York City. Allison & Partners and Fast Company: Fast Company: Are You Experienced? North American Precis Syndicate (NAPS) provides an easy, cost-effective method of reaching millions of additional readers, listeners, and viewers nationwide by getting a story out to nearly every newspaper in the country, thousands of websites, more than 6,500 radio stations, and more than 1,000 TV stations. NAPS can distribute a story in a wide variety of formats that editors can choose to reproduce as is. NAPS works for most Fortune 500 companies, the top 20 PR Firms, over 100 associations and many government agencies. Ogilvy Public Relations Worldwide and Jelmar: CLR & trade; Cleaners Help Couples Manage "Chore Wars & trade"
JetBlue Airways: Carmageddon: JetBlue is So Over it! 360 Public Relations, now with offices in Boston and New York, creates fresh, on-strategy campaigns that engage audiences, build fans and deliver meaningful results. Social media has been part of our core offerings ever since the revolution. Find out why more brands are calling us their partner. Ogilvy Public Relations Worldwide is a global, multi-disciplinary communications leader operating in more than 70 markets around the globe. We blend proven PR methodologies with cutting edge digital innovations to craft strategic programs that give clients winning and measurable results for corporations, government agencies, trade associations and not-for profit-organizations. The firms' seven specialized practice areas are healthcare, consumer marketing, public affairs, corporate, technology, social marketing and 360 degree digital influence. Formula PR and Bohemia: Bohemia's "The Kahlo Challenge"
Named PRWeek's 2009 and 2010 "PR Education Program of the Year," the Master of Science in Public Relations and Corporate Communication offered by the NYU School of Continuing and Professional Studies, provides cutting-edge curriculum that is grounded in both theory and practice. Subject matter is immediately applicable to your work environment. Faculty members are industry professionals who bring unparalleled insight to the classroom. Guest lecturers offer fresh perspectives and professional events provide invaluable networking opportunities. Business Wire, a Berkshire Hathaway company, provides press release and multimedia delivery into news editorial systems worldwide. Choose from hundreds of industry and geographic circuits - we'll optimize press release content for search engines, post to thousands of websites and add social media sharing functionality. And, our innovative online newsroom hosting services and measurement reports provide additional communications tools. Learn more at BusinessWire.com and the BusinessWired blog; follow updates on Twitter: @businesswire or on Facebook. Founded in 1979, Makovsky + Company is one of the nation's leading independent global public relations, change management and digital branding consultancies, specializing in integrated communications programs for the financial, professional services, health, technology and energy sectors. Our tagline, the Power of Specialized Thinking™ underscores the deep knowledge and relevant relationships we bring to client engagements. Our specialized focus has drawn not only a certain type of client, but a certain type of professional as well: analytical, entrepreneurial and passionate, with a deep understanding of sector-specific business issues. Based in New York City, the firm has agency partners in more than 27 countries and in 37 U.S. cities through IPREX, the second largest worldwide public relations agency partnership, of which Makovsky is a founder. Hager Sharp and HHS's Office on Women's Health: Best Bones Forever! IBM is a leader in helping clients around the globe harness the potential of interconnected technologies to improve the way the world literally works. Through its expertise in services, consulting, software, hardware and world-class R&D, IBM is creating intelligent systems that increase the flow of traffic, protect food supplies, enhance electrical grids, improve healthcare and make cities safer and more efficient. For more information, visit ibm.com/smarterplanet. Weber Shandwick is a leading global PR agency with a commitment to client service, creativity, collaboration, and harnessing the power of Advocates. It provides strategic execution in consumer marketing, healthcare, technology, public affairs, corporate/financial, and crisis management. Specialized services include social media, advertising, market research, and corporate responsibility. Ogilvy Public Relations Worldwide and Kimberly-Clark's Huggies Brand: Helping Diaper "Every Little Bottom"
Ogilvy Public Relations Worldwide and LG Mobile Phones: LG Text Ed: Face the Facts. Send the Message. GolinHarris is a holistic communications firm designed to help clients win in a complex, connected society. Our g4 model provides clients with a dedicated team of specialists who combine strategy, creativity and engagement into one seamless package. Core practices include consumer marketing, corporate communications, digital/social media, healthcare, multicultural marketing, technology and public affairs. Kwittken & Company is an elite communications agency that provides its clients with results that extend far beyond traditional PR. We work with brands in the media/publishing, travel, luxury, fashion/retail, design, healthcare, financial services, technology and B2B sectors to help them realize their business goals through intelligently designed, results-oriented campaigns. APCO Worldwide, CEA, and David All Group: CEA's Innovation Movement Video Brochure for Capitol Hill – "America is Ready for a Comeback"
Pfizer Inc. is a research-based, global biopharmaceutical company. We apply science and our global resources to improve health and well-being at every stage of life. We strive to set the standard for quality, safety and value in the discovery, development and manufacture of medicines for people and animals. Our diversified global healthcare portfolio includes human and animal biologic and small molecule medicines and vaccines, as well as nutritional products and many of the world's best-known consumer healthcare products. Every day, we work across developed and emerging markets to advance wellness, prevention, treatments and cures that challenge the most feared diseases of our time. Consistent with our responsibility as the world's leading biopharmaceutical company, we also collaborate with other biopharmaceutical companies, healthcare providers, governments and local communities to support and expand access to reliable, affordable healthcare around the world. Edelman is the world's leading independent public relations firm, with more than 3,200 employees in 51 offices worldwide. 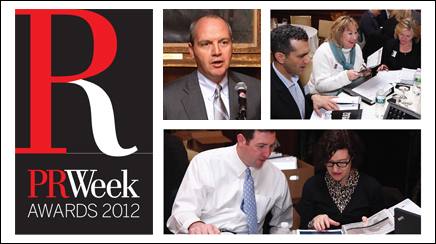 Edelman was named 2009 "Agency of the Year" and "Large PR Agency of the Year" three of the last four years by PRWeek. The Holmes Report named the firm the 2009 "Best Large Agency to Work For," and Edelman was listed as a top-10 firm by Advertising Age in 2007 and 2008. In 2007, CEO Richard Edelman was honored as "Agency Executive of the Year" by Advertising Age, and in 2007 and 2008 he was cited as "Most Powerful PR Executive" by PRWeek. Edelman's network includes specialty offerings Blue (advertising), StrategyOne (research), BioScience Communications (medical education/publishing), MATTER® (sports/entertainment marketing), and Creative (editorial, design, production). Visit us at www.edelman.com for more information. Coyne PR is one of the nation's fastest growing and most sought after full-service firms. Coyne embraces its tagline, “Where You Want to Be” to create breakthrough creative and smart strategic PR, social media and integrated campaigns for some of the world's most prominent companies and brands including The Walt Disney Company, Burger King Corporation, Goodyear Tire & Rubber and Hard Rock International. One of the world's leading full-service, global PR agencies, Ketchum delivers innovations that help clients across all industries quickly realize their communications goals. As a sponsor of the PRWeek Awards, we congratulate all the finalists. Chandler Chicco Companies (CCC) is a global health communications group that delivers unmatched perspective and creative know-how. With an integrated approach to communications, CCC offers best-in-class capabilities spanning public relations, digital and social media, medical and scientific education, marketing and branding, graphic design and multimedia, event production, and research and measurement. For all things health, we've got communications covered. For more information visit www.chandlerchiccocompanies.com. Fleishman-Hillard Inc., one of the world's leading public relations firms, has built its reputation by using strategic communications to deliver what its clients value most: meaningful, positive, and measurable impact on the performance of their organizations. The firm operates worldwide through its 80 owned offices. For more information, visit www.fleishman.com. Deloitte LLP is the US member firm of Deloitte Touche Tohmatsu. Its subsidiaries provide audit, tax, consulting, and financial advisory services through more than 40,000 people in the U.S. Known as an employer of choice for innovative human resources programs, it is dedicated to helping its clients and people excel.